Lego Scooby-Doo! 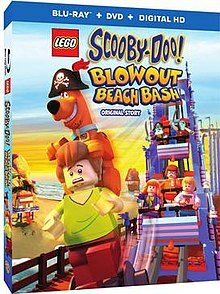 Blowout Beach Bash is a 2017 direct-to-DVD computer-animated comedy film, and the twenty-ninth entry in the direct-to-video series of Scooby-Doo films, as well as the second in the series to be based on the Scooby-Doo brand of Lego. It was released digitally on July 11, 2017 and on DVD and Blu-ray on July 25, 2017. Scooby-Doo! & Batman: The Brave and the Bold was released on January 9, 2018. ^ "LEGO Scooby-Doo! : Blowout Beach Bash July Digital HD, Blu-ray Release". 19 May 2017. ^ Osborn, Alex (30 October 2017). "Scooby-Doo! and Batman: The Brave and the Bold Trailer Debut and Movie Details". This page was last edited on 24 January 2019, at 09:27 (UTC).